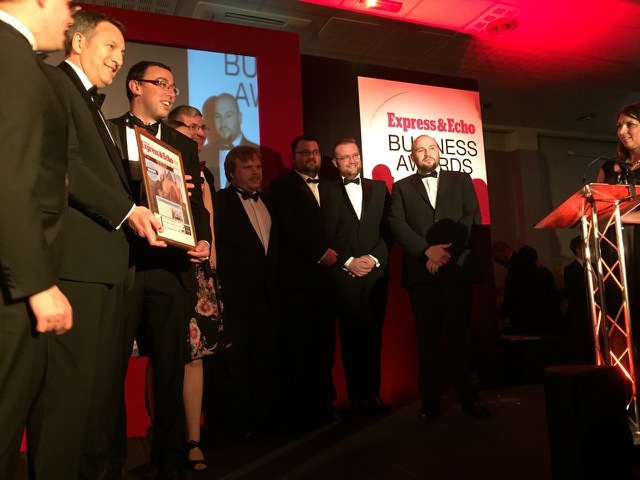 Innovative IT firm Hosted Desktop UK (HDUK), based in Exeter, is jubilant after being announced as the Express & Echo’s Small Business of the Year at a gala ceremony at Sandy Park last week. And if winning the most hotly contested category in this year’s Business Awards was not enough, the firm was also selected as a finalist for the prestigious Business of the Year category. The cloud computing firm is getting accustomed to such accolades, as this awards success comes hot on the heels of HDUK being recognised both regionally and nationally by two key business publications. The firm was revealed as one of Real Business’ 50 most disruptive firms, while its founder Adam Chetnik was also selected as one of Business Insider South West’s illustrious 42 under 42 Club, celebrating the region’s brightest business talent. HDUK’s sales figures make for impressive reading, having enjoyed 60% growth on the previous year’s sales figures and increasing turnover year-on-year since the company launched four and a half years ago. Designed to enable more flexible working by replacing the traditional, in-house IT infrastructure, HDUK’s tailor-made hosted desktop system quickly attracted users within the accountancy sector. However, the firm soon evolved to reflect market demands by expanding the types of services it offers as well as its client base and the company now boasts over 6,000 users. In addition to sustained popularity within the accountancy sector, HDUK is expanding into new markets such as charities, legal firms and property companies. The firm now employs 15 full-time staff to keep pace with its growth strategy while ensuring existing customers receive the same high level of expertise and customer care. Click here to find out more information about HDUK’s range of services. This entry was posted in Company news, HDUK News, Press releases and tagged Business Awards, Exeter Business Awards, hosted desktop uk. Bookmark the permalink.